In an adventure equal to any a storyteller might relate, a crippled serving girl faces the intrigues of the harem, the dangers of the streets, and the anger of the Sultan himself to find the needed ending to an incomplete story. We were required to read this for my introduction to young adult literature course and this was the one that grabbed my attention the most just based on the cover. It took a while to get to it, but once we read it, I knew it was going to be my favorite of the entire course. 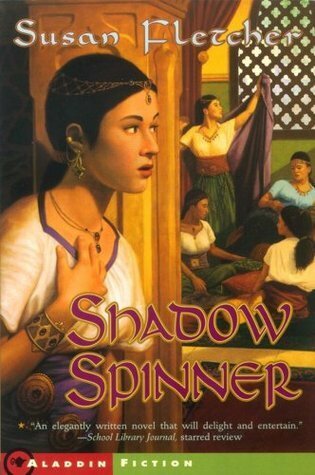 Our unit on historical fiction was such a great one, especially while discussing this book. Though this title is based on Arabian Nights, it is still an absolutely beautifully told story that I fell in love with. Our main character Marjan lives in a world dominated by men and their choices. Her mother crippled her at a young age in order to prevent her from being taken by the Sultan as one of his many wives (which he would take a wife and then kill her in the morning after they were married). It was only Shahrazad who was able to stop him with her stories, as each night she would spin a story and not tell him the ending. The next night she would continue weaving the story together and then, if it ended, start a new one so he’d want to hear more the following night. In this story, Marjan is not taken for her beauty, but because she is smart. She is able to tell wonderful stories and Shahrazad, running out of stories after years of creating them to keep the Sultan entertained, takes kindly to her as she is able to help her continue her storytelling journey. Marjan is an inspiring young woman who stands up to help her people. This short but moving story kept me captivated throughout the entire thing and had a deeper message within its pages. I’m so grateful to have been exposed to this book and I look forward to rereading it in the near future. Absolutely recommended for anyone who loves historical fiction or is even skeptical about it and is looking to break into a new genre. A fast, easy read with a lot of complexity and heart.